HomeMail is complete e-mail solution for home and smaller office users. It will enable you to send emails either within one computer or among computers within a local network. do you need to leave message for family member or colleague? Send e-mail instead of sticking a paper note on the fridge! do you need to give some files to other user (on the same computer or on another computer)? Send the file(s) as an attachment instead of explaining him/her where to find them in the directory structure of your hard-drive or shared folders! 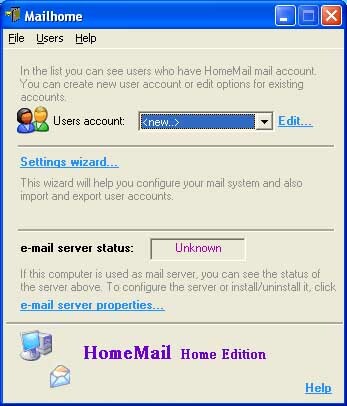 Note that HomeMail does not contain e-mail client (the program you actually use to read and write mails). You can use Outlook Express (installed as a part of Windows) or any other client. HomeMail will help you configure the client to send and receive emails. Homemail is offered in three versions: unlimited trial, home and professional. The following table provides information about differences between the versions. Reminder window every time the program is started. You can send only one email to each HomeMail mailbox (when you send another email to the same address, it will overwrite the previous email). Trial-reminder email is send with every email. HomeMail Home Edition Max. 5 e-mail accounts per server. Server can be installed on up to 3 computers within a household. HomeMail Professional Edition Unlimited number of accounts per server. Server can be installed on unlimited number of computers within a local network. Download HomeMail Trial version (hmail_t.zip - 960 kB).